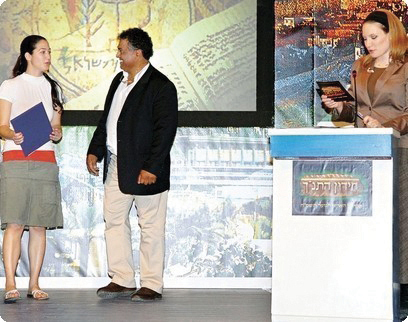 Israeli Journalist Infiltrates Tiferet Yeshua Congregation | What Tehiya didn't Say About Us! The headline reads, “Baptizing Cult”. The darkened pict ure is meant to portray us as weird and secretive. She arrived while Ari and I were in Germany, and began making friends among the congregation’s young people. She attended a number of times until a few days ago, when Ari received a rather unpleasant phone call from one of the editors at Yediot. He began by accusing us of “converting to Christianity” under-age kids without their parent’s permission - illegal in Israel. Three days later, (on 08.08.08), a vicious, twisted article of nine solid pages (24 type-written pages) came out in their weekend magazine which has very wide coverage. The article was designed to scare the public - to prove that Messianic Jews are dangerous, law-breaking, mystical misfits. called “The Messianic Code” (Like the Bible Code). 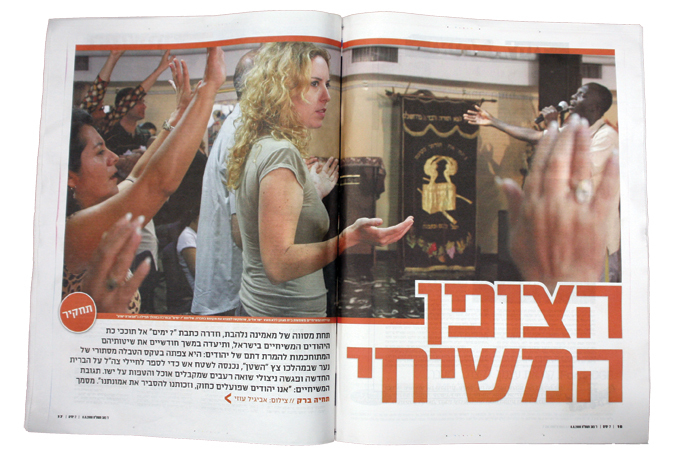 Newspaper journalist (center) posing as a Messianic Jewish believer. She brought a "friend" along who took this picture for her newspaper. TOP LEFT: Ari and Youth Leader Motti with new believer as he is immersed in the Mediterranean sea. BOTTOM LEFT: Ari speaking with Tehiya after the immersion. At the time she was posing as a new believer. RIGHT: Yacov Damkani takes his Christian volunteers to sing to the soldiers in army camps. Also, when journalists speak about missionary work, they virtually always claim that the people the “missionaries” are able to reach are those who are oppressed and downtrodden - and thus easy catches for the missionaries. Messanic believers, on the other hand, will reply that only God can change a person’s heart and make him into a new creature. People can fake it for a while, perhaps thinking they are going to receive some material help. But when that does not appear, the fake seeker soon goes his own way. My Sabbaths were spent in ecstatic, long prayers, and the rest of the weekdays I dedicated to aggressive missionary activities and internal social events of the congregation. I won their trust, and they - slowly but surely - embraced me into their world. Little by little a Messianic-spiritual world was exposed to me, which at its core lies a closed [closed?? That is an interesting observation! editor] and embracing congregation, at times mesmerizing, which forms a warm and sheltering home with not so few people who found it difficult to find their place in Israeli society - and a moment before they were crushed in its margins, found refuge in the bosom of Yeshu; despairing youth who had descended into crime, ultra-Orthodox Jews who left their way and suffered alienation by their families, lone soldiers, immigrants, foreign workers. Tehiya was told by her Jews for Jesus friend: “this is a large congregation, with a lot of young people and a lot of the Holy Spirit. I am certain that you will be happy there.” And so, within a moment, my journey begins, which by its end I am sentenced to find myself confused and divided - Judas Iscariot woman that I am. A ll this occurs at the outskirts of the industrial area of southern Tel Aviv. The entrance is in between two peeling buildings. On the entrance floor is a small kiosk and adjacent to that is a gas station. In the area, such is told to me by one of the brothers, there is also a casino and other dubious businesses. TOP LEFT: Tehiya passing out flyers as she pretends to be a believer. BOTTOM LEFT: Congregants praying together. RIGHT: Yacov Damkani with soldiers. However, the staircase is sparkling clean. A few of the youth in the congregation come early in the morning every Saturday, and sweep the filth - cigarettes, syringes, hard liquor bottles. At one stage, when passersby and members of an ultra-Orthodox organization harassed the Messianics, there was a security guard at the entrance. A t present day, for discretion purposes, there is not even a sign. TOP: A young man, once himself a drug addict, has opened a home in downtown Tel Aviv for addictted prostitutes. The pictures on the floor are of the prostitutes and are points of prayer. BOTTOM: Believers talking to soldiers. Tehiya then narrarates her madeup story to Damkani. She adds, “It is not every day that a young Israeli requests to join the mission field, considered horrendous in the eyes of most residents of the State of Israel. I find it hard to breathe under his gaze: what will happen if my cover story should collapse?" These days are not easy for the Messianic Jews. From time immemorial the believers have suffered harassment, however, during the past year, they have a growing sense that the satanic circle is closing in on them and getting stronger. During this past March, an explosion caused severe injury to the son of a Messianic family in Ariel; two months thereafter, in a large bonfire, recorded on photographs which shocked many, New Testament books that were distributed by Messianic Jews were burned in Or Yehuda [translates Light of Judah]; In the meantime, the call to cancel the traditional, annual Bible Quiz [on Israel’s day of Independence] was on account of the participation of a young Messianic girl. [See last article]. Our reply is that our congregants are normal, wonderful believers, part of the family of God that is world-wide. Our theology is Biblically based, we would say, normal, middle of the road. But the way the newspaper describes us, (cult like) as those who make it very difficult to leave the congregation, gives the reader the impression of a bonafide cult. In fact, all who are believers know that when a Jewish person comes to the faith, the leaders, throughout the land, encourage and instruct these young believers to strengthen their ties with their families and to be exemplary in their work place and/or in their studies. What Tehiya DIDN’T Say About Us! Although Messianic Jews are far from perfect, the accepted theological base for our faith is that without love we are but sounding brass and a clanging cymbal. On the other hand, the state religion of Israel, Orthodox Judaism, teaches its adherents to love those who are similar in religion and to hate those who are different. Lying, cheating, stealing and violent behavior is not acceptable to any congregation of Messianic Jews and those who are found doing so are seen as outside the fold. One does not need to be a statistical genius to point out that Messianic Jews have the lowest crime rate of any community in Israel, including all other religious groups. A moral lifestyle is central to a Messianic believer. Messianic Jews are encouraged to study at universities or learn a profession and work for a living and pay taxes. A majority of ultra-Orthodox men do not work and do not pay taxes. On the contrary, their politicians agree to join government coalitions mainly in return for handouts from the taxpayer’s pocket to support their own non-working population. Messianic Jews serve with pride in the Israeli Defense Forces, knowing we have a duty to protect our nation. Ultra-Orthodox refuse to serve in the army, and some branches even refuse to recognize the legitimacy of the government of Israel, although willing to take government grants. In a nation that suffers from severe corruption in the government, ultra-Orthodox politicians headed up by rabbinical authorities have been role models of corruption in every area of public and governmental service. Think of it! In Israel, drug dealers, mafia, pimps, criminals and perverts are accepted as Jews. Gurus, witches and transvestites are part of the Jewish people. But Messianic Jews, whose contribution to society is almost always positive, are despised and rejected by the establishment, and told they are not Jews. Messianic Jews pray for their enemies. The Orthodox curse their enemies. Messianic Jews are being continuously persecuted, especially in Beersheva and Arad, and the police are doing nothing. In fact, after five months, the police have not even talked to the witnesses that have agreed to testify in behalf of Ami Ortiz, the youth who was bombed by ultra-Orthodox terrorists in Ariel because his father David is a Messianic pastor. United we stand...and grow stronger! Messianic Jews of Israel are growing in number, in confidence and in love. I would like to take a moment to encourage our brothers from Tiferet Yeshua who were highlighted in the recent Yediot ar ticle I just now read. Of course the article was very negative, and probably you could have had more discernment, and we all need to learn from this kind of thing. However, I was very encouraged to read about your congregation's activities, the way you are reaching out to Israelis, the way you are following up on those that visit, your commitment to fasting and prayer and the devotion you have to caring for the poor and needy. In many ways I saw this ar ticle to be a powerful testimony to Yeshua, in spite of the harmful and destructive motives from which it was written. The thing about persecutions is that it groups us all together. Persecution is no respecter of persons. We are all in it together, whether we like it or not. Today I was approached by a friend of mine about the article who knows that I am a follower of Yeshua. always agree with what Damkani, Sorko-Ram or other Messianics always do, that I was very proud of the way they are standing up for what they believe. And I want to say that to you as well, my brothers. I am proud to stand with you and your congregation, even though it may mean suffering or loss for the sake of my Messiah. 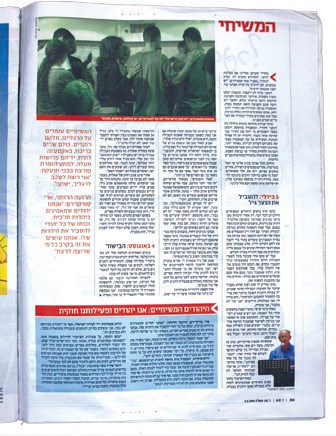 The recent Yediot article has sparked some very good discussion with our neighbors, close friends, and family members. We love Ari, Shira and family - and Yacov. It is a great privilege to stand with them. ‘Chazak v’Amatz’!! [Be strong and courageous!] Glory be to God! I also want to express my solidarity with the Tiferet Yeshua congregation who have recently been the target of a ver y negative newspaper ar ticle in the Yediot. I do suspect that it will have the effect of creating curiosity and you will see people drawn to the Lord and his people. “Now, Lord, look on their threats, and grant to Your servants that with all boldness they may speak Your word, by stretching out Your hand to heal, and that signs and wonders may be done through the name of Your holy Servant Yeshua” (Acts 4:29-30). Not long ago the English language Jerusalem Post carried a story on its front page, “Messianic Jews to Protest ‘Discriminatory’ Immigration Policies”. The article focused on the concerns of a visiting group of 300 members of a large union of Messianic Jews in the United States. Within the same paper was an entirely separate article entitled, “Local Messianic Jews Say They Face Increasing Fear of Attack”. This article was bordered, highlighted in a different color, and bore a picture of Ami Ortiz, the young Jewish believer terribly wounded when opening a booby-trapped gift basket left on his doorstep during the Feast of Purim. One remarkable thing about these headlines is the presence within them of the words “Messianic Jews”. This name (in its Hebrew form, Yehudim Meshihim) within the past few months has also begun appearing in the mainstream Hebrew-language press. Messianic Jews are Jews by birth who believe that Yeshua/Jesus is the promised Messiah, but who do not believe that their faith in His saving work cancels out their inheritance as descendants of Abraham, Isaac and Jacob. undoubtedly related to the fact that Israeli Jews, religious or secular, are taught from childhood that it is impossible to be a Jew and to believe in Jesus. Bat-El Levi, a 11th grader Messianic Jew, won this year's National Bible Quiz for state schools and was one of four finalists from Israel competing for the International Bible Quiz Championship on Independence Day. cuts one off from the faith and even the race of the Fathers. And so, for the past thirty years the presence of a Messianic Jewish community here within Israel has gone largely ignored. Lord they serve. But recently this has begun to change—and it’s doing so quickly. In several newspaper articles of recent weeks, Messianics have actually been allowed to describe their beliefs, in some cases without the usual “equal time” comments of an “anti-missionary” representative from the ultra-Orthodox community. against them. In some cases, the new media coverage is causing such tactics to backfire. 70 years ago, organized a “book burning” in which volunteers went door to door gathering the materials for the bonfire. This resulted, however, in an outcry regarding religious freedom in Israel, with one of the popular newspapers featuring a color spread on the incident. An attempt during the nation’s celebration of our 60th year of independence by the Orthodox to disqualify a Messianic Jewish teenager from the annual International Bible Quiz for Jewish youth was rejected, and the incident was sympathetically covered in the media. There has always been oppression by elements within the religious Jewish community of modern Israel against Jewish believers—in some cases accompanied by violence. With this oppression appearing to have now advanced into the area of attempts to maim or murder, there is a serious question as to what this portends for the future. Even with the growing media exposure and coverage mentioned above, incidents appear to be on the increase, not always making it into the news. Nor is the news coverage itself always resulting in blessing. We spoke with a young pastor recently who was ready to “sign” on a new meeting place for his congregation. The owner was aware it would be an organization of Jewish believers in Yeshua, but assured him that it made no difference. Then he read the articles about the bombing in Ariel, with the strong implication that it had been perpetrated by Orthodox Jews against Messianic Jews, and he backed down—the fear that the presence of Messianics might bring similar acts of violence adversely affecting businesses in his area was too great. 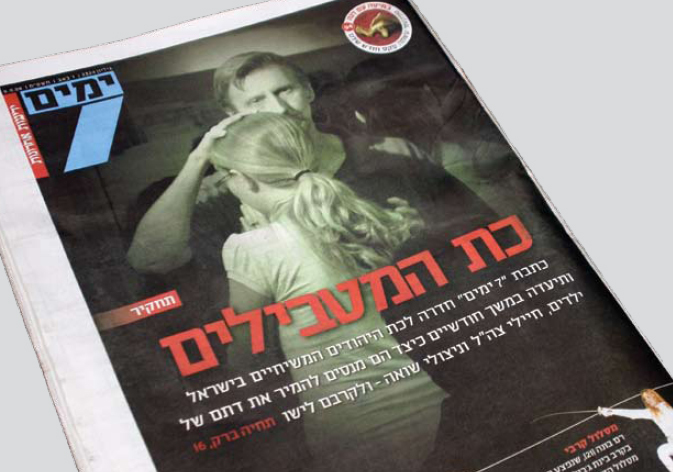 Lately, leaflets appeared in a southern-Jerusalem neighborhood with pictures of several Messianic pastors, and bearing in Hebrew the words, “These people are members of a cult called “Messianic Jews”. The Supreme Court ruled regarding this cult that ‘Judaism vomited them out” BEWARE OF THEM !! !” This kind of harrassment is common enough but these leaflets also included the home addresses beneath the pictures of each of the Believers. * That accurate testimony regarding the existence of Messianic Jews in Israel and of their beliefs would continue to be released through the Israeli media. * That the believing Jewish community in Israel would continue like their Master “increasing in wisdom and stature, and in favor with God and men” (Luke 2:52). * That Israeli believers in Yeshua would permeate the marketplace, the arts, the military, and the government. * For love, courage, endurance and vision for those who are beginning to experience persecution for their faith. * For special protection for those targeted by satan, that angels would keep violence from coming to their doors. That they would move in strong spiritual discernment regarding those who might knock on their doors. * That God will work in the hearts of those bound up in traditional religion, using the very plans of the enemy to awaken a curiosity which might lead them to the Truth. We know former ultra-Orthodox who have come to faith because they had questions which their rabbis couldn’t answer—and they contacted those which their media had warned them to stay away from. It is interesting that even the threats have begun to use the words “Messianic Jew”—implying that these really are Jews who are choosing to follow Yeshua as Messiah and Savior! Martin and Norma Sarvis serve on leadership of Succat Hallel, a 24/7 worship-intercession ministry in Jerusalem. This year's Jewish New Year begins on the evening of September 29. We have a beautiful Jewish calendar for you, our partner with Maoz Israel Ministries and Congregation Tiferet Yeshua. The 16-month calendar (September 2008 - December 2009) has simply gorgeous paintings by famous Messianic Israeli artist, Pamela Suran. As you can see, things are heating up in Israel. More interest. More exposure. More persecution. More seekers. More people coming to faith. The Gospel is taking root in Israel. The Messianic movement is steadily making progress in the large cities, the medium-size cities, in villages, farms and kibbutzim. The leaders are moving toward more unity. We are getting together to discuss how to stand against such organizations as Yad L’achim that are turning violent against the Messianic Jews. Believers are bolder than ever, and our growing congregations give individual believers more confidence to witness and to introduce friends to our community. 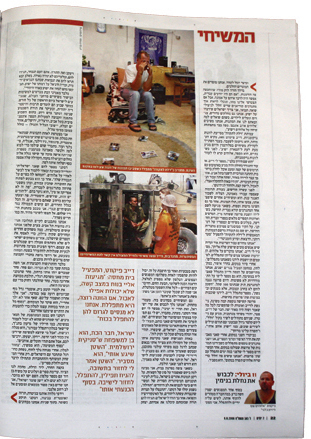 After this Yediot newspaper article came out, we received encouraging phone calls and emails from all over the country. Here is one from a good friend whose name we will not publish because of his sensitive job in Jerusalem. This is a classic case of God already working for good what the enemy intended for evil. There would have never been an article like this if interest in the true identity of Messianic Jews were not growing significantly. Now this interest will grow even more and the cult allegations will be exposed for what they are. No doubt this has been a very agonizing experience for you. But I am convinced in my spirit that the Lord is going to do something great through it and that down the road, you and Tiferet Yeshua will be fully vindicated. I still remember a vivid dream from two years ago in which God was using you, Ari, to enlarge the path for Jews to be saved. May your gifts and calling be fully realized in the days to come! Now our job is to keep moving forward. To not let up for a single minute, but to look to God for effective and better ways to bring the message of GOOD NEWS to a nation that sees little hope on the horizon. As always, the army of the Lord must work in unison - linked together. Those who are called to stand on the front lines. Those who are called to pray, and those who are called to financially support what God is doing in the Land of Israel—exactly as He promised to do. Our team - you and all of us called to serve in Israel - cannot be stopped. No newspaper article, no slander, no lies, no circumstances, no temporary setbacks can stop God’s truth from going forward in Israel. Together, we are unshakeable! We love being on the team with you. We cannot win and finish the race without you and we are grateful you are on the team. Together, we will win! P.S. 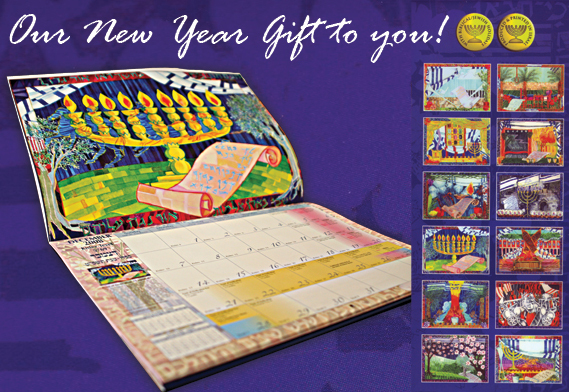 Be sure to request your beautiful 16 month Messianic calendar this month! It’s yours for your gift of $35 or more for the salvation of Israel.